Private... No crowds or public walkover!!! Maximum occupancy is 10 persons. No exceptions. 'Nestled Inn' is located in a PRIVATE beachside neighborhood of only 6 homes in the heart of Seagrove Beach, south of Highway 30-A. Our beach is NEVER crowded.... Gulf views from the third floor!! (3 Kings, 2 Queens) Step from the the first floor living area to a private pool, plus splash pool for kids. From the pool area, the Gulf is a 45 second walk via private beach access. 'Nestled Inn' is one row away from Gulf front...close enough to hear and see the surf rolling onto the shore. The privacy in this neighborhood is exceptional. Enter Nestled Inn and feel truly private and relaxed! The first level is walk in friendly, no steps!!! There is a living area/kitchen, laundry room, full bath, master suite and bath, garden tub and shower. The terrace offers a covered area with a dining table and six chairs, pool, splash pool, lounge chairs and outdoor shower. One master and two baths on the first floor. The second floor offers one master suite/King with porch, bath/ shower and two other bedrooms/one bath, one king, one queen. Media room, flat screen tv, bar, sink and refrigerator and large, covered porch with rocking chairs and dining tables overlooking the pool area. The third floor offers one private bedroom/bath and balcony, queen, gulf views and endless stars at night! A great place to sip and relax after a full day on the beach! The amenities are everything you would expect in a modern beach home, including hi-speed wireless internet access, HDTV, DVD Dolby Surroundsound, undercounter kitchen icemaker, and separate stove and gas cooktop. Top of the line cookware and dinnerware. Washer, dryer, gas grill. Seagrove Beach is between Seaside and Rosemary Beach, an area of the Gulf renowed for its beautiful emerald colored water. It is not a highly commercialized area, but water parks and roller coasters are 25 minutes away in Panama City. Seafood markets are close by, as are a half dozen excellent restaurants. Outstanding golf courses include Camp Creek, and Santa Rosa Country Club. The Watercolor Publix Grocery store is 6 minutes away. Sunday to Sunday rental during summer. No smoking and No Pets. No exceptions. Free unlimited long distance. Wireless internet access. Nestled Inn @ Seagrove Beach was built in 2004 and is owned by Gordon Van Mol of Lake Oconee, GA; Andy Philips and Tom and Loretta Flowers of Columbus, GA. Many of the neighborhoods in Seagrove Beach are quite congested with limited parking, not to mention the crowded beaches. However, our home is located away from the condos and multi family homes, providing extraordinary privacy on the beach. It's a dream come true!! First floor Master downstairs has a garden tub and freestanding shower. First Floor laundry area also has a full bath with shower. Second Floor Master has 2 shower head tiled shower. Second Floor Hall bath to 2 bedrooms is full bath with shower/tub combination. Third Floor full bath with shower/tub combination. Steps away from the beach. Private beach. Nestled Inn is located on the south side of 30A. Private with no public access. 'Nestled Inn' has Gulf view from all levels. From our private pool, it's a 45 second walk to the beach. Gas in the second floor master suite. More seating is available at the counter and outside terrace and second floor porch. Are a big plus. Kitchen had all you need to cook. Great spot for vacation. We are glad you enjoyed your stay. Please tell your friends about your experience. We have spruced the house a bit with new paint and furnishings. The home is equipped with all the necessities should you enjoy eating in each night as we ventured out but only once the entire week. The two master suites where perfect for two adult couples. The four kids enjoyed the upstairs entertainment space immensely as the large couch became their base camp throughout the week each night after what appeared to be an endless back and forth of beach vs. pool. Loretta was very responsive of any request. A beautiful, well equipped and spotless home for an unforgettable "Summer Escape"! 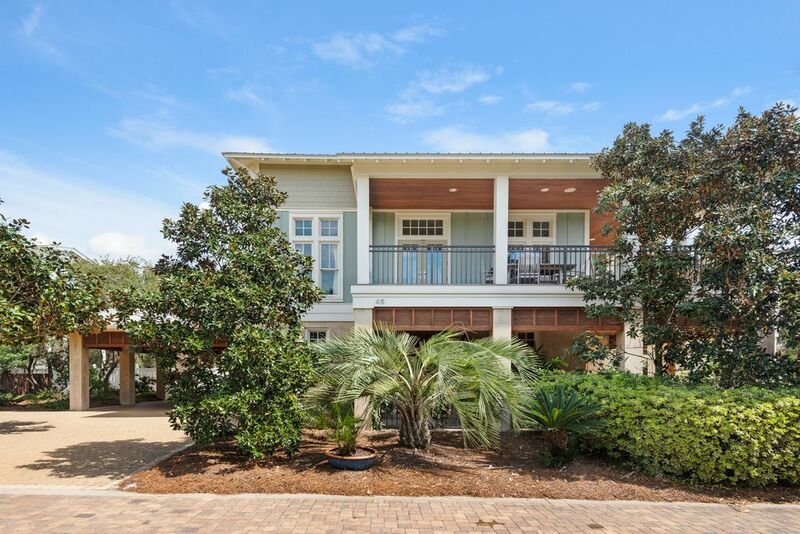 In our top (2) vacation homes on 30-A after 10 plus years of travels to the Emerald Coast! Would recommend to anyone who would ask! Spent week of 6/23-30/2013 at Nestled Inn. This was family's third summer to rent the house from Gordon. Each stay has been fabulous. The house is spectacular, open, spacious and loaded with amenities, spotlessly clean on arrival and much better than described. Kitchen is so well stocked there is no need to bring a thing. The pool is wonderful, right off the living room and well protected by a door alarm that keeps kids safe. There's an amazing Fire King grill with accessory element for large pots beside the pool; cooks great steaks, hamburgers and fish. Rooms are huge as are the closets and bathrooms and the beds are comfortable. Third floor bedroom has a small balcony with a stunning view ot the gulf. Beach is a short walk down a shaded path to the walk-over and on to that extraordinary white, sugar beach for which 30A is famous. We take canopies for shade and leave them broken down under the walk-over steps at night with our beach chairs. Never a problem. Goatfeather's seafood market is a couple of minutes west on 30A; open 10 to 6, always crowded but well worth the wait. Get shrimp seasoned and steamed and take them back to peel and eat. Seaside is about 10 minutes west, Watercolor another 2 minutes further and Rosemary Beach is 20 minutes east, so there is plenty to do nearby. A word about the landlord, Gordon Van Mol: extraordinary!!! Extremely attentive and responsive; knows the house and its mechanics inside-out and gets problems, which have never amounted to much anyway, tended to immediately. Our family has been vacationing in the Seagrove area for over 30 years and Nestled Inn provides by far the best beach vacation we've experienced. This home was the perfect location and size for our family to meet for vacation. The house was spacious with beautiful decor and amazing views for our 3 families. We were concerned about keeping the kids occupied since the weather was a little cooler at the start, but there were games and the heated pool kept everyone busy. We bundled up and took quick trips to the beach (a 2 minute walk.. if even!). The beach was very private, but located in the middle of two areas with lots I activities if you wanted to stroll down the beach. We had room for our badminton and volleyball net and felt very safe leaving it up at night. We spent time shelling and even found sharks teeth, crabs and huge shells. We biked in to Seaside a few times and there are little shops to either side within a 5 minute walk. We also walked to the seafood market and picked up fresh fish a few nights to cook in. The kitchen had everything you could ever need! Even spices!! And on the second floor is a Keurig, so bring your pods! There is so much that makes this house unique and comfortable. We commented several times that we felt like we were staying in a friend's beach home and not a rental because of how well the house was kept up. The owners were very responsive from beginning to end and even after checked in to make sure everything went well. We were pleased beyond expectations and would highly recommend this home for your next family vacation. We stayed at Nestled Inn last summer for a week and my boys did not want to leave! We had concerns because of the oil spill and Gordon was so great to work with. The beaches were pristine and where the house is located its like your own private beach. (I believe the area is shared with 6 houses of so but we never saw anyone.) The kids loved the pool and the dual master bedrooms are great for two families. I would highly recommend...we hope to go back this summer! We spent a week here this summer and were awed that it was much more than we'd expected. The home was formidable and beautiful, but comfortably furnished. There was plenty of room for everybody. The back yard and pool areas were incredibly relaxing. We hope to return! Nestled Inn is privately located in the heartbeat of 30A. Every entertainment available is located within a 5-20 min. walk, bike or car ride. You never have to get in your car to enjoy Seagrove and surrounding areas. Our beach is private and not crowded which makes Nestled Inn so desirable. Enjoy seafood, shops, fishing, kayaking and if you need to explore further, San Destin Outlet mall is less than 30 minutes away. You can have it all... even a trip to the marinas in Destin and Panama City... 30 minutes. There is a maximum capacity of 10 persons. Spring break rentals are to families only. Tobacco use anywhere on the property is prohibited and will result is forfeiture of damage deposit. No pets.